Corner view of the Alexander Signature Select from Nest Bedding (close-up). Corner close-up of the Love & Sleep mattress from Nest Bedding. We unflinchingly stand behind our CertiPUR-US certified Luxury Mattresses. All of our mattresses are thoughtfully designed and manufactured here in the USA, using industry leading materials and sourced from the USA. Our organic and natural mattresses are held to the highest of Nest Bedding standards. In addition, we promise to provide customer service that exceeds that of all other brands. We are one of the only brands to offer our customers an option to completely exchange to another firmness at no cost, or upgrade to a different bed entirely. Lastly, our industry leading Lifetime Comfort Guarantee gives our customers a Nest Bedding mattress years down the road, at half the price. We want you to love where you sleep, for the rest of your life. You've just received your new luxury mattress and bedding and everything is great. It's time to sleep and dream away. When it comes to your sleep, we truly care and want you to experience the best sleep possible. So we have a 100-night risk free and in-home trial on all of our mattresses and bedding. 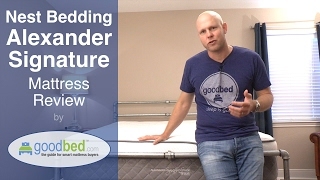 To explore whether the Love & Sleep is the right choice for you, read GoodBed's expert review of the Love & Sleep mattress or watch our in-depth video review of the Love & Sleep mattress. Based on 1,759 real owner experiences with this brand. How do people like you rate their Nest Bedding mattress? Mattresses are personal. Filter the 1,759 Nest Bedding ratings by sleep position, weight, age, gender and more to find the ones that are most relevant for you. The Nest Bedding Alexander Signature Series line has 756 ratings and 281 reviews on GoodBed. 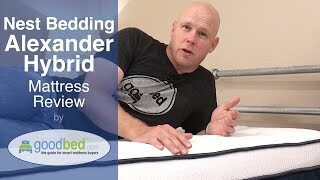 The Nest Bedding Alexander Hybrid line has 497 ratings and 179 reviews on GoodBed. The Nest Bedding Love & Sleep line has 58 ratings and 19 reviews on GoodBed. 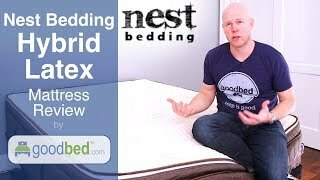 The Nest Bedding Hybrid Latex line has 43 ratings and 11 reviews on GoodBed. The Nest Bedding All Latex line has 4 ratings and 1 review on GoodBed. 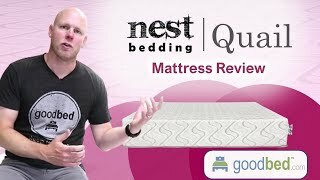 The Nest Bedding Natural Latex Hybrid collection has 7 ratings and 0 reviews on GoodBed. Nest Bedding mattresses are recommended by 85% of owners on GoodBed (based on 1,759 ratings + 599 reviews). Want more reviews from Nest Bedding mattress owners? Do you have something to say about your Nest Bedding mattress? Write a Review! Nest Bedding is a mattress manufacturer that is based in Albany, CA in the United States. Nest Bedding is sometimes known as NestOrganics. Additional product details can be found by viewing discontinued mattress models from Nest Bedding. Have an update or correction to our information about Nest Bedding? If so, please take a moment to suggest an edit. Nest Bedding mattresses sold by Nest Bedding come with a 100-night in-home trial. Nest Bedding mattresses are only available online or through Nest Bedding stores. Click here to check for a location near you.